This is a found photo with absolutely no helpful information. There's nary a word or a date stamp on the front or back. 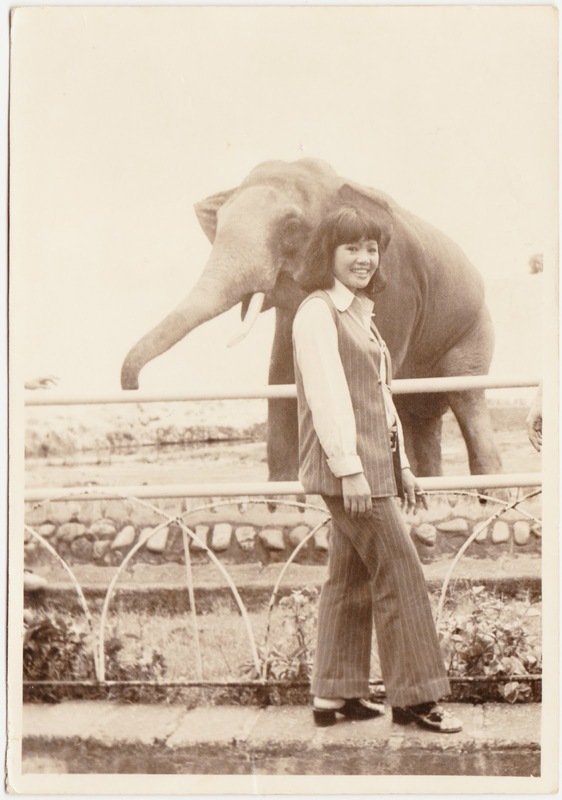 So all we know if that it's a woman standing and smiling in front of what might or might not be a real, living elephant. At first glance, I thought the elephant was real and that this snapshot was taken at a zoo. Now I'm not so sure. If it's a statue or sculpture, that might make this location a little easier to identify, as the world can't have too many lifelike elephant sculptures, right? Please share your thoughts on this pressing issue in the comments. And what do we think about the style of the woman's clothing? Late 1960s? Early 1970s? By the way, I believe this is the first Papergreat Pachyderm Post since the sad tale of Dondi in June 2011.